The money pit strikes again! We have just spent a really entertaining 6 months trying to evict a deadbeat tenant. I kid. There was nothing even mildly entertaining about it. But let’s start at the beginning. Here’s a factoid about us: we own a duplex and live in one part and rent out the other. For years it’s been no big deal, in fact it’s been great! The rent covers the mortgage and the tenants have been almost universally nice (pleasant folks who pay the rent on time). We have been excellent landlords – we fix stuff that breaks and upgrade stuff that needs upgrading, all in a timely fashion. We don’t raise the rent unreasonably and generally do our best to be fair and conscientious in our dealings with our tenants. And in return we have had no big problems and tenants who tended to stay a long time and who all took good care of the house. And then along came 2018. We had been renting the house out to a youngish couple for a few years. Then in Jan 2018 the wife notified us that she was leaving and wanted her name off the rental agreement. There was mention of job issues, an injury, disability (wait, what?). She took the dog and the cat with her and left us with her highly dysfunctional (as it soon turned out) ex-husband. The first month or two of the year were okay – rent came in on time and things seemed pretty normal. Then about a month later, he was so late we sent a 3-day or quit notice and charged a penalty (as was laid out in the rental agreement). We asked what we could do to help – he swore he was getting his act together (silly us, we believed him). We continued to do maintenance (pest control to address a rat issue) and generally continued to be good landlords. And here is where I have to admit that for the fist few months I buried my head in the sand and just hope things would magically sort themselves out and left the unpleasant dealings (demanding rent, issuing 3-day or quit notes, etc) to Chuck. But by mid-summer, we’d reached our limit and started researching eviction and soon discovered that it is no easy thing. Chuck tried initially to do it himself (thanks, Rocket Lawyer!) but I became concerned when I realized a hard fact about eviction – the law is largely on the side of the tenant and it’s a pretty complicated process. Now I get that there are some awful landlords out there who have done really awful things to tenants. Still, it feels like the law has over-corrected on the side of the tenant. But I get that’s just my opinion. Anyway, Chuck spent a month or so trying to navigate the legal maze of the eviction process before we pulled the plug on the DIY thing and decided to call a lawyer. That was in late August. The law firm issued a 60-day or quit notice in late September so needless to say we’ve see no rent since September. We kept hoping that the tenant would move, that we’d see some indication of action. But no. Once the 60 days was up we had to wait for the writ of possession and the lockout date. That took an additional month or so. At the lockout the tenant was escorted out (and we learned that 6-10 subletters squatters had been staying there too) and we regained possession of the house, sort of. The tenant then had 15 days to get his stuff out of the house before we could actually get in and start cleaning, etc. He took all 15 days and then didn’t take it all. 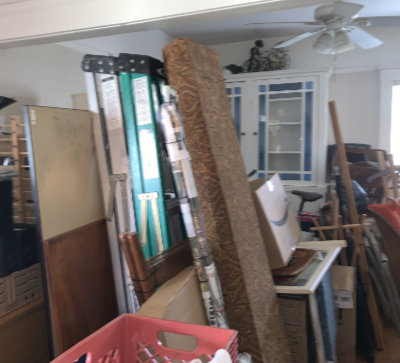 Well, he took the stuff worth any $$ and left us with literally tons of garbage and junk to dispose of – a garage packed to the gills with junk scavenged from dumpsters, a bathroom piled high with icky clothes, tree trunks stacked in the side yard – you name it, it was probably there. Who knew throwing junk away can be so expensive? We installed a Ring security system and a Ring doorbell which has slowly restored our peace of mind. At the end of day, once the junk was hauled away, the main issue with the house was filth, lots and lots of it. The overall condition of the house was pretty good and for that we feel grateful. But it’s going to be a while before the memory of this awful experience fades, if ever. Chuck said the other night that he dreamed that all of the stuff we had tossed came back – I think those sorts of dreams will plague us for a while. Maybe it’s too soon to start watching this show.